It is fair to say that the ancient Greeks gave to the literary imagination some of the greatest female characters, that they created, even, the very genre of a female protagonist. In a world presumed to be dominated by men, male thought and undeniably masculine politics, it is women who often offer the starkest, most poignant and unflinching portraits of the complexity of the human psyche, of society, its structures and mores, of the inherent ambivalence in some of the greatest ideals, and of the vital necessity for ethics that reconcile the letter with the spirit of the law, that join, Socratically, the human with the divine. From Antigone to Hecuba, from the rebellious, proto-feminist Lysistrata to Athena casting her vote at the end of the Oresteia, or the wise Diotima of Mantinea whispering in Socrates’ ear, from wounded, manic Hera to the murderous, enigmatic Clytaemnestra or the indomitable, forsaken Electra, women in the mind of the Greeks were both the forerunners of a different civilising vision and the all-too-human shades of our passions, of our inexorable darkness and light. Among them, Medea stands perhaps supreme, Medusa-like, but also terrifically majestic, a monster of nobility, a paradigm of the chthonic powers of the subconscious but also a sublime treatment of the clash between reason and impulse, between power and understanding; of righteous anger and the totality of human self-destruction. She was one of the most powerful ciphers in antiquity, commanding almost unequalled symbolic power. Medea was the dramatists’ pinnacle, the philosophers’ stone – above all she was a memento mori not to be ignored by the powerful and the wise. Julius Caesar is even said to have bought for his Temple of Venus Genetrix a pair of very expensive paintings by Timomachus, depicting Medea and Ajax in their hubristic, almost demonic anger, but also in their very human dignity. Unlike Clytaemnestra, who was often seen as an aberration, a deviation from human norm, Medea has always been the subject of almost obsessive analysis by philosophers, writers or historians, from Pindar and Hesiod to Euripides, Apollonius of Rhodes, Valerius Flaccus and Seneca or Ovid, but also Herodotus, Epictetus, Diodorus Siculus, Arrian, Pausanias, Hyginus or Plutarch, even Dracontius. One could even claim that Anna Karenina or Madame Bovary belong, after a fashion, to that lineage of women for whom madness, violence, the beyond-the-human, become the only visible reaction to extreme, male-induced frustration and total erasure. The first to give Medea tangible corporeality, a psychosynthesis where the limits of reason and consciousness merge in violent fission with the depthlessness of animistic insularity, was Euripides. His Medea adds elements to the collective myth which would become indelible, in particular the lethal ruthlessness that coexists so harrowingly with an apparent rationality and consciousness. His Medea is the maximisation of horror, while being at the same time an accusation against the marginalisation and civic disqualification of women, the fear of the Other, or the relationship of the individual and of the state with vengeance as an impulse but also as a political strategy. It is no accident that the play was written and performed on the eve of the Peloponnesian War, when the Athenians had to confront the problematics of an aggressive, avenging military policy, as well as their history of colonial ambition, the aims and consequences of territorial expansion, the nature of their encounters with the Other. Euripides’ Medea is an amēchanon kakon, an untreatable evil (Epictetus would prescribe pity as the remedy). Her most infernal trait is that she is aware of evil and chooses consciously not to desist it, within a logic where approval and visceral disapproval scream as fiercely: “we were born women incapable of performing noble actions, but such skilled architects of every kind of harm”; “I know what awful harm I am about to inflict, but my raging anger overbears my free will”. At the same time that he emphasises the situational exegesis of Medea’s actions (she has been used, wronged and abused by Jason), Euripides exposes the amorality underlying all conflict between passion and reason, between self-regarding urge and ecumenical empathy – a sharp analysis of contemporary socio-politics that did not go down well with the Athenian adjudicators: his trilogy came third (and therefore last) in the annual contest. Following Herodotus and Democritus in their examinations of violent ire versus rational thought, Euripides is perhaps the first to pair the will to anger with the state of barbarity. 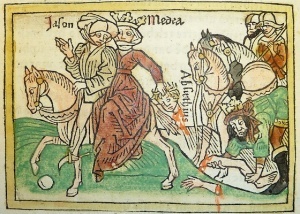 The greatest Medea to follow is that of Seneca, who exploits the folklore origins of the myth to their bloodiest extent: his heroine derives directly from the chthonic deity at the centre of Corinthian cult: she is above all a sorceress, elemental, primeval, invoking Hecate and the powers of a very dark underworld. Whereas Euripides’ Medea threw herself outside the precincts of human society and ethics, Seneca’s Medea consciously traces her place as being by definition beyond the human, through a lineage of divine ancestry: she is inhuman because she is superhuman, as terrible and awesome as a goddess. Seneca is notorious for the Janus-face of his discourses: the serenity of his philosophical treatises and the brutal violence of his dramas. Medea in his hands embodies an uncanny psychopathology, a reflection of the self-indulgent moral ambivalence tearing apart Roman society. Medea’s nachleben is something we cannot ignore; it is an intractable fixture of all that she is. Arrian tells us Jason and Medea come out of collective memory, and Pausanias reminds us of the cult statue dedicated to Terror in Corinth, “a woman frightful to look upon”, which would be associated, inevitably, unsurprisingly, with Medea. We lack, lamentably, Ovid’s own Medea, his only play, and we must make do with his Metamorphoses and the two epistles in his Heroides (Medea and Hypsipyle writing to Jason their complaints), where for once we see a subtler characterisation, of Medea’s journey from impressionable, innocent youth to fearsome supernatural force. 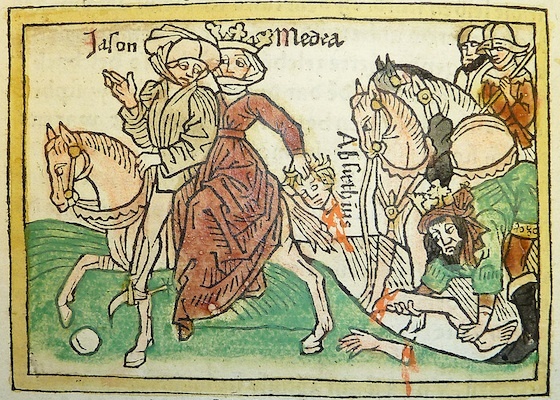 We are incredulously told by Apollodorus that Medea is Achilles’ posthumous bride on the Isles of the Blessed; perhaps we rejoice that Jason is punished, at last, as an ancient Casanova in the 8th circle of Dante’s Inferno, while Chaucer includes Medea among the Good Women, after having meticulously listed her crimes and errors. Anouilh focuses on domestic savagery, on the clash of world perceptions, Christa Wolf, more recently, gives us a Colchis that stands for a socialist paradise, a Medea liberated from the games of power that shackle Peleas, Jason, Aeetes, even Creon, whereas Heiner Müller regresses to a moribund exploration of guilt and culpability, devastation, a graphic renunciation of crime. In whatever guise or ideological construct, whether historical, mythical or philosophical, Medea is still part of our collective psyche, a reminder of all that we can be if we fail our own humanity. This is the heritage David Vann determines to make his own in Bright Air Black, an impressively ambitious reimagining of Medea’s character and story from what he describes as a perspective of unmitigated realism and historical veracity. Vann intends to take us back not to 5th-century Athens or Seneca’s Rome, Corneille’s and Anouilh’s Paris or Pasolini’s quasi-lunar landscapes, but to 13th-century Greece, splendid and contradictory, warts and all. In a terse, gritty, elliptical style, Vann creates an all-engulfing portrayal of Medea, a single point of absolute, relentless focus, of almost claustrophobic darkness. In his hands, Medea returns to some extent to her pre-Euripidean metaphor: a sorceress who can only exert power over untamed lands, realms beyond humanity that can provide her with the poisons and remedies she needs for her white and black magic. She is the woman who usurps some of the power of men, a lawbreaker, a motherless female archetype from an unspeakable age. Medea, Vann seems to be saying, is transgressive against transgression, in what is an intriguing treatment of socio-political dynamics and a rather ingenious apposition between weak Athena and muscular, blood-lusting Hecate. The journey from Colchis to Iolcus is long, perhaps too long, a nightmarish descent into an atavistic underworld of horror. In this first section, which takes up almost half of the novel, descriptions can appear repetitious, a malevolent incantation, often without a firmer anchorage in plot. Vann’s Medea inhabits a proto-human, post-Titanic world on a catastrophic collision course with the emerging humanism (and inconsistency) of the Olympians. Totemic men of myth are pitted against ratio-centric men of history; the fathomless, untameable, unknowable sea against a measurable and knowable arable land. Vann has clearly absorbed not only scholarship and theoretical approaches to antiquity, but has especially thought about and explored the attribution of symbolic roles to male and female gods, natural forces, landscapes and social conventions. He possesses a powerful mind, distinct diction, a formidably fecund imagination, as well as a very tactile awareness of language, narrativity, the art and craft of creative writing. In Bright Air Black, one cannot help but admire the scope of this venture into myth and reality, into violence and redemption. One would wish, however, for a more complex treatment of people and circumstances, even of history and culture. The forced manipulation of archaeological indices can feel disturbing, agonising, a struggle against the multiple personas of Medea and the rich strands of meaning in her story which have held writers, composers, philosophers, readers and audiences frozen and entranced for centuries. The cultural projections onto the mores and psyche of early 13th-century, essentially Mycenaean, Greece are bafflingly tenuous, ethnologically obscure, perplexingly anachronistic. Vann’s Medea emerges as flat and undeveloped, a disconcerting exercise in monomaniac savagery, a deranged, unilateral, barbaric genius, for all the fiery intensity of her darkness. Hints at political ambition or the empowerment of women in the civic sphere become obfuscated behind a highly atmospheric characterisation of his heroine, who proves to be no Miltonic Satan. And she seems to be alone, not simply isolated, marginalised, displaced, but quite literally the single, singular voice and point of view in the narrative, surrounded by an extravagant medley of loosely referenced gods and shadow characters. Vann aims at creating a heroine who “is something left over from an earlier time”, and his Medea interprets reality exclusively through animism, older cults and magic. Human art, the human mind, seem inaccessible to her, she is as much an existential and intellectual outsider, as she is a social outcast. She is comprised only of forms she has willed into existence, or shapes traced out of darkness, invading reality from another realm. It is an almost animal monism, annihilating in its relentlessness and lack of differentiation or even of a blinding revelation. Vann is at his breathtakingly best when he conjures up with ferocious horror and viciousness the scenes of Medea’s crimes, especially the ritual rejuvenation of the ram and then Peleas, her absolute imposition of her will upon the king’s daughters. Vann’s Medea is terrible in that scene, otherworldly, fiendish and uncanny, chillingly material and real. A greater sense of direction to underpin what is undeniably a poignant display of sustained tension, would have rendered this retelling of Medea’s story into a truly worthy addition to what is a uniquely rich tradition. What one misses, ultimately, is an understanding of a greater purpose, an insight into Medea, her environment, her predicament and her demonic choices, which would raise the questions she embodies with greater resonance, even if it cannot fully illuminate them. Vann’s exploration of fear, Medea’s true source of power and catastrophe, is perhaps the pivotal point that could have secured the story’s strength – something we do see at the very end, in what are truly tragic moments of apocalypse, desolation, a lacerating catharsis. Darkly, the climactic last sentences of Bright Air Black take us back to a world of mists and horror, of almost indecent relish – in a cyclicity that deprives Vann’s novel of what could have been true brilliance: Medea will slit the throats of her own children, then lick their blood, as she intones “form of fear, earth god unnamed. Jason won’t dare follow. Beyond human law, at war with the sun”. 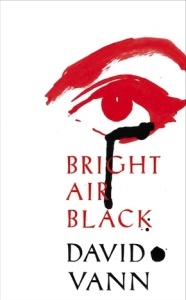 Bright Air Black is published in hardback and eBook by William Heinemann and Cornerstone Digital. Previous postInternet dating for immortals Next postPioneers Awake!